Astro – One Happy Ending! The Racing Horse pleaded with the Welsh public to wake up and appreciate a talent in their midst! We had lamented the indifference the principality had shown to one of their sons - now hopefully things are about to change! 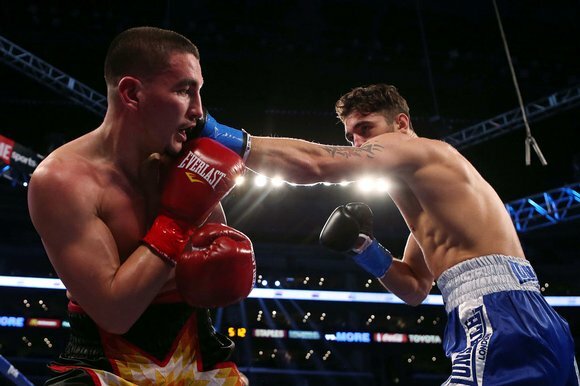 The live US televison audience saw Nathan Cleverly retain his WBO world title tonight with an eighth round stoppage of Shawn Hawk. Ultimately the Cefn Fforest fighter was a class above his 'Sioux Warrior' opponent at the Los Angeles Staples Centre though Hawk showed remarkable bravery and resistance and a worthy contender! Cleverly dominated from bell to bell with his speed,combinations and technique but had to unleash several intense flurries of blows upon the American to finally convince the referee to call it off in round eight after two knockdowns in the seventh. One could not help wondering what would have happened had the challenger the full-time to prepare for this fight, he was one dangerous customer and earnt every cent of his $40,000 purse. That said Cleverly took the fight without knowing anything about his challenger and had fully prepared to fight a south-paw and not an orthodox. The Racing Horse knew personally how tough this year had been on Cleverly regarding well-being and career momentum! Also, Cleverly had not fought since February but he quickly shook off any ring rust. This supreme performance proved how the man has grown. Prior and during the fight he radiated confidence and when he adopted different styles at different times within the fight he once again proved his ability to think on his feet. This time he assessed matters in a red-hot pressure-cooker environment and something Champions need to be able to do. Irrespective of his opponent and the last-minute shenanigans this was a huge test all things considered! The first four rounds Clevery walked straight into the hard-hitting Hawk fighting close up as if to assert but decided he could not get the leverage he wanted. In rounds five and six he adopted a totally different style jabbing at range, landing with more power, especially to the body and generally controlling his opponent. Once he realised the damage he was doing to the body of his challenger he knew he had found the right style and mix for this fighter. In the seventh round Cleverly decided to step things up and exploded with another onslaught that pinned back Hawk with vicious body shots putting the home favourite down for an almost ten count. This was followed by another knock-down in which the Hawk was lucky to be saved by the end of round bell. In the eighth Cleverly produced a vicious left hook to again fell his foe, another onslaught finally convincing the referee to step in and stop proceedings at the same moment the Hawk corner threw in the towel.The win made Cleverly the first boxer to stop Hawk inside the distance and boosted his unbeaten record to 25-0 in only his second appearance Stateside. The champion's next target may be to bring another American back to the UK in the form of Bernard Hopkins, something Golden Boy Promotions chief Oscar De La Hoya this week admitted he was keen to arrange. He said: "What is very possible is Bernard Hopkins going to Britain to box Nathan. We feel that the UK fans are some of the most passionate and knowledgeable in the world when it comes to boxing. A lot of fighters in the United States are now realising they should go overseas and challenge the best." Cleverly will now move onto bigger and better things in 2013 and now singer Tom Jones has endorsed him we expect a surge of belated patriotism from the principality to their boxer - where have you all been? Feel this should have been stopped in the 7th . Lets hope he gets the recognition he deserves not only in this country but in the states as well. It was a great performance! Thrilled to see how calm Nathan was yet able to change tack when needed. He has not had the recognition but hopefully that will change now.. He is a wonderful boy and a champion! The Racing Horse thinks the world of him….